In 2014, 167 000 children were injured in vehicular accidents and more than 1000 of them died. In fact, car accidents are the number one cause of death in children. However, correct installation of car seats can reduce the chance of fatality by 50% for infant seats and 70% for convertible seats. Take the time to read through this quick guide and never hesitate to seek out more information about car seats and safety – it could make the difference in your child’s life. Infant car seats are rear-facing and often feature a seat that snaps into a base. This is typically the popular choice for newborns, since the seats are smaller and often fit nicely into a stroller. Also known as “five point harness” seats, these larger car seats can be used as both rear and forward facing seats. They feature a chest clip and buckles and can be tethered or anchored to the vehicle or attached with a seat belt. A booster seat is a sort of final step before eliminating the need for car seats altogether. Booster seats use the regular car lap and shoulder belts and are designed to simply raise a child up so that the belts are effective. Size and weight restrictions can vary by brand so it is very important to read the installation guide or warning labels to determine if the car seat is appropriate for your child. Infant 0-20 lbs. 0-2+ There can be no less than 1 inch between the top of your baby’s head and the top of the seat. Convertible 20-40 lbs. 2-7 Even though these convert, try to keep your child rear-facing for as long as possible. Booster 40-80 lbs. 4-12 Be sure to use the red clip on the car’s seat belt to ensure proper fit. When we talk about common mistakes as parents, most of the time they are issues we can laugh off or work toward remedying. However, car seat safety is no laughing matter and make the difference between life and death for your child. 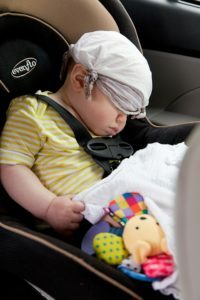 Most mistakes made with car seats come from lack of knowledge. Be sure to always follow the manufacturer’s installation guide and, if all else fails, visit your local police and fire station for help in proper installation. Threading the seat belt through the wrong slots. While car seats are not overly complicated, there is a lot going on in the back that can make proper installation confusing. Double-check the installation guide to make sure you are threading the belt through the proper slots. Otherwise, the seat could become projectile during an accident. The car seat should not be able to move more than 1 inch from side-to-side and back and forth. If you need to, place your knee in the seat and push down when tightening the belt or anchor straps. If you have difficulty, seek aid from the police, fire department or someone who is trained in car seat safety. Using both the anchor clips and seat belt. You may think using both is a double whammy of safety, but installing both the anchor clips and seat belt will cause issues if your child is in a vehicular accident. As I mentioned above, the seat should not be able to move more than 1 inch in all directions, but this 1 inch ensures that the seat properly absorbs any impact. Using both the anchor clips and belt may cause the seat to be too stationary and an impact will cause harm to your child. Improper place of chest clip. THE. TOP. OF. THE. CHEST. CLIP. MUST. BE. EVEN. WITH. THE. ARMPITS. I’ve seen so many children strapped into car seats with the chest clip all willy-nilly (and, yes, I do say something). If the chest clip is too high, an impact could damage your little one’s airway. If it is too low, an impact may damage soft organs. Number one: make sure that chest clip is in the proper position! Otherwise, always test the tightness of the straps by pinching the harness belt. If you can pinch the material, it is too loose. Car seats are always evolving and changing but the bottom line is to make sure it is properly installed and that your child is properly buckled.